Baton Rouge: Open your hearts and veins for a great cause tomorrow, get a PreSonuSphere T-Shirt! Baton Rouge residents: PreSonus is partnering with The Blood Center for a blood drive on Tuesday, May 21, from 9 a.m. to 1:20 p.m. There is currently a national shortage of blood, and sadly, deposits made to a blood bank do not accrue interest—so the Red Cross needs all the help they can get! Just a pint of blood can save up to three lives! Please Click HERE to ensure you are eligible to donate. It is important to eat a good breakfast before donating blood and be sure to bring your photo ID! 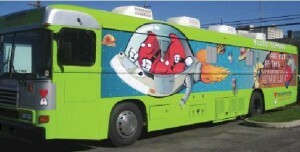 The blood mobile will be located behind the Bon Carre buildling, near the PreSonus Audio Electronics entrance. If you are interested, email jobs@presonus.com to confirm a time slot, and here’s some handy tips from the Red Cross for a successful donation. Generous souls not suffering from trypanophobia will walk away with a bandage on their arm, a song in their heart, and a killer PreSonuSphere T-shirt!